Nearly 3 years have passed since the publication of the How to Add Column in Sales Order Grid in Magento 2.1 article. Over this time two new versions – Magento 2.2 and 2.3 – have been released. With the introduction of new versions, the syntax of UI Components has also been updated. Therefore, it seemed logical to update the article and adapt the code for Magento 2.3. There are few intuitive changes in the code that affected sales_order_grid.xml file. Magento 2 UI components serve for generation and display of several lists and grid types. Moreover, you can create a component yourself on the basis of the already existing code; yet the description of this mechanism is worthy of a separate article. For this one, we will focus on extending the sales order grid with an additional column. Actually, it’s rather simple to add a new column to a grid, unlike, for example, create a new column with filtering. So let me describe how to implement it in Magento 2.3. NB! The code in XML format I will put below is valid solely for versions 2.3 and further. If you still use earlier versions of Magento, I strongly advise you to migrate to Magento 2. All the directives are situated in the <module>/view/adminhtml/ui_component/ directory. First, create a “sales_order_grid.xml” file. The filename has to match a parent component that we will extend. Let me break this piece of code down. adds a column into the order grid. Class Module\Ui\Component\Columns\OrderGrid extends the Magento\Ui\Component\Listing\Columns\Column class. This way we can fill the row data. Let’s now return to the sales_order_grid.xml file. All the code written in the argument line and below is related to the column description. The following line allows us to render any valid HTML code in the cell. Magento 2 supports a few pre-defined template renders out of the box, all of them are placed in module-ui. The type of column (date, column, actions, multiselect, select or thumbnail) to use is defined by the component. Both templates and components are placed in the module-ui. At this stage, there is already a column in the order grid and the task is completed. However, if you require filtering by this column, we will proceed to work. 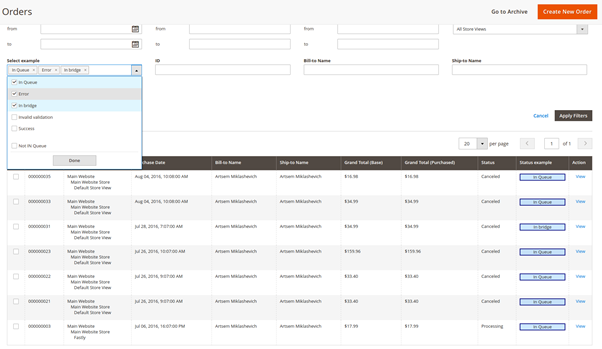 Adding our column into sales_order and sales_order_grid tables and control CRUD operations for the sales_order table (sales_order_grid table and sales_order table are synchronized by cron). Writing a new plugin for a fast column update. I specified the class in which the filter value will be defined. This class should carry out \Magento\Framework\Data\OptionSourceInterface interface. Therefore, we use the collection as a filtering source. And now we apply the plugin that adds our data into filtering results. You can find the described above module here: https://github.com/Galillei/sample_add_columns_to_order_grid/tree/2.3. Bear in mind that Magento has kept the compatibility with the old ui-components structure, which means that the code for 2.1 version may work for 2.3 as well. In this very article, we demonstrated how to describe ui-components using the new syntax.